One of the best ways to improve a facility is to become a more visual workplace. This means that as much information as possible should be conveyed in a visual way. This can be done with signs, labels, symbols and many other things. The reason this is so effective is because people are far more likely to notice and remember information they gather visually rather than something they hear. In addition, when done properly, a visual workplace will have multiple reminders in place for all the instructions, which makes it more difficult to forget. 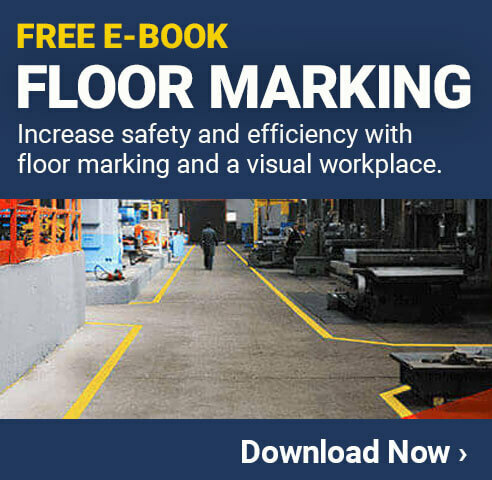 The following five strategies can help you to identify where your facility can benefit from better visual instructions, and how they will improve the safety, productivity and overall efficiency of the workplace. One of the only things that can make a visual workplace less effective is when there is an excessive amount of outdated information. For example, if you have a bulletin board up in the employee lunchroom to post notices and other information, it can be very helpful. If someone looks at the board, however, and sees a post from several months ago that is no longer relevant, everything on the board will be ignored. Make sure you have a system in place for all visual information in the facility that will make sure it is updated and important at all times. As soon as something becomes obsolete, it should be taken down or updated. This will help ensure that everyone knows that they need to pay attention to all posts, signs, labels and other information that they see. You can see how the National Federation of Federal Employers instructs their local chapters to keep their bulletin boards up to date and engaging HERE, which helps to ensure they have a more effective visual workplace. On this same note, if your facility stops using a particular visual process, it should be removed completely. For example, some facilities may use a whiteboard to keep track of work schedules and assignments. This is a great option, but if the facility moves to a computer based system, the whiteboard should be taken down and removed from the area to avoid causing confusion. Some people make the mistake of thinking that if they simply put up a few signs around the facility that they are creating a visual workplace. The fact is, however, that when signs and other items are poorly placed, they can actually cause more harm than good. As Close to Subject as Possible – In most cases, you want the visual information to be as close to the subject it is addressing as possible. So, if you put an aisle sign up to let people know what is stored in an area, make sure it is clear that the sign is for the proper aisle. Put Controls Behind Instructions – If you’re using a sign to give safety controls for a specific job, consider placing them behind the job instructions. This way, whenever someone takes the instructions for a specific job, they will immediately see the controls as well. Easy to See – You need to make sure that the visual information is easy to see and read from the location where it is needed. For example, having a sign hanging from the ceiling that says vehicles may be driving in an area might not be a good idea. Instead, using floor marking tape to show this information is much more effective. Proper Lighting – Similar to the previous point, you need to choose the location so that it is properly illuminated otherwise people won’t be able to see it. Many signs in facilities give general information about the subject that they are providing information about, which is a good start. To take it a step further, however, you can add actual examples to signs in many cases. One way to do this on a sign that instructs readers to always use the proper labels on containers before filling them could be to put an actual label on the sign so they can see what it looks like. This is a simple process which can be done by printing off a sample label on your industrial label printer. Adding it to the sign will make it very clear to the reader what they are supposed to be doing. You can even give two or more examples so they know what to choose from. Having a safety sign that says something like, “Use this Label for Corrosive Chemicals or this Label for Non-Corrosive Chemicals” can be very helpful. Placing the specific label just after or under each option will make it very simple for the readers to understand. One problem many facilities run into when it comes to making a visual workplace is that each area tries to do things their own way. While this may be better than nothing, it can be far more effective to have a series of standards that are followed throughout the facility. Colors – Selecting specific colors for specific subjects can be helpful. Red can be hazard alerts, blue can be general information, and green can be directional instructions. Of course, make up your own set of standards. Shapes – You can select different shapes to have different meanings. This can help people to understand the sign, even if they are too far away to read the actual words. Pictograms & Symbols – Using standard pictograms or symbols can help to convey a lot of information with just a quick glance, as long as everyone knows their meanings. Find which standards can help your facility become a more visual workplace and start implementing them right away. When you are creating a visual workplace, it is important to know when it is best to keep it small and simple. One example of this is when you are using floor marking tape to identify where a particular item is supposed to be stored. For example, if you have a place to stack pallets in the facility, it is good to mark the area so that the pallets are properly placed. You could use marking tape to put a complete square around the entire section. For a simpler, cleaner look, however, why not just use floor marking corners? This will give the same effect by without giving the floor a cluttered look. Of course, you’ll also benefit from the fact that less tapes means there is less chance for it to get damaged over time. The most important thing with each of the five tips mentioned above is that you need to make sure that you continue to maintain the visual items in your facility. Putting up signs is great, but if they are not properly cleaned when dirty or replaced when damaged, it will do no good. Part of any good visual workplace is having the system in place to keep it well maintained and effective.